The Chesapeake and Ohio Trail (C&O, also called CNO by some) is a dirt trail running from Washington, DC, to Cumberland, Maryland, covering 184.5 miles. It’s predominantly uphill, at a gentle grade. 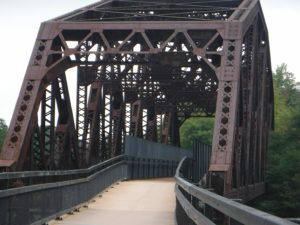 It’s a great ride for any bicyclist who loves waterways. The tree-lined trail follows along the Potomac, providing breath-taking views whether its mist rising or crystal blue waters frothing to white as huge boulders block its journey down to the Atlantic. On the other side is the reason this tow path began in the first place: remnants of the canal that transported goods until the railways took over. 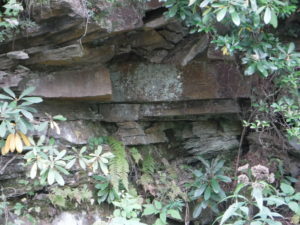 The Great Allegheny Passage (GAP) is a crushed limestone trail running from Cumberland, Maryland, to Pittsburgh, Pennsylvania, covering 150 miles. It’s uphill for the first 24 miles, crossing the famed Mason Dixon Line and the Eastern Continental Divide. After that, it’s predominantly a gentle downhill. 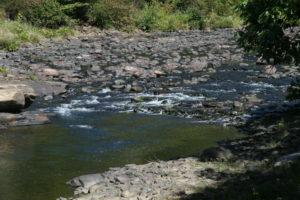 About fifty-six miles in, you’ll pick up a creek, and ultimately the Casselman River and then the Youghiogheny River for another long stretch, until you end with the Monongahela River. If you haven’t ridden the C&O or GAP before, you might wonder what it takes to ride the trails. You might think you know, and your negative self-talk begins—you don’t ride enough; you’re not fast enough; you don’t know what you need to pack, and so on, until you’ve talked yourself out of any possibility of enjoying an adventure on these gorgeous trails. Time, so you can ride your pace and your distance. Nothing says you have to tackle the entirety of either trail. A bike capable of sporting the panniers to turn your steed into a pack mule, if you’ll ride for more than one day and no one is driving SAG for you. Tires beefy enough to handle the off-road terrain of the C&O, about 32 mm with some tread is comfortable if you’re riding a road bike; but you can do this on a comfort bike, a mountain bike, an anything-you-like bike. They’re all out here. Your sense of adventure. Come prepared to push out of your comfort zone, to meet new people, and to learn the histories that make the trail towns special, with General George Washington at the center of some. Native American roots run even deeper. What don’t you need? To be ultra fit, or a hard-core bicyclist. Sure, it helps to have some bike muscles, especially if you’re riding with others, but let your sense of adventure dictate the ride and you’ll be fine. Before I began this fall’s adventure, I had only 218 miles, and I was about to tackle nearly 150 in 10 consecutive days of riding while my friends planned all 335 in 7 days. 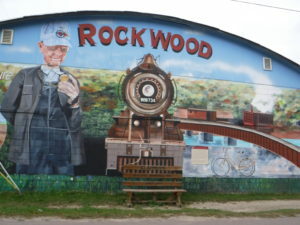 Since these are predominantly towns whose heritage traces back to the heyday of the trains, they’re often spaced ten to twelve miles apart—the distance steam engines could travel before needing more wood. Just be sure you pick towns that have places to stay. If you’re doing this as a vacation, then you have all day to ride whatever distance you chose. Groups like BikeCandO and the Allegheny Trail Alliance provide a wealth of information on the amenities in each town. The Trailbook, updated about once a year, highlights points of interest on the trail. B&Bs advertise there, and it’ll point you towards the fantastic local bakery, the pie restaurant where you’ll think you’ve died and gone to homemade-pie heaven, the one-stop gasoline/mini-mart/deli in Rockwood that’ll save your behind if the weather turned cold and you want to warm up, and so much more. What you pack for the trip is up to you—less weight means you’ll be washing your bike shorts and jerseys regularly; every photograph of you when you’re off the bike might show you in the same t-shirt, where the only differences are which ketchup, mustard, or pizza sauce stains you’ve added to it since the previous day’s photos. Quick-dry hiking pants weigh less than jeans. Don’t think you’ve got the fitness for it? I rode it, and I sprained two toes two and a half days before this year’s trip. Did I let it stop me? OK, I did catch the bike shop shuttle from Cumberland, Maryland, to Frostburg, Pennsylvania, but that made for a bed and breakfast story all by itself. That’s some of the fun of traveling, sharing stories of the road with cyclists from Chicago, Pittsburgh, and DC, eating farm-fresh eggs, locally made sausage, and locally tapped maple syrup. Ride secure in the knowledge that these trails cater to bicyclists. Read up on who offers what services, so you’ll know where you can catch a lift if you run out of steam. After two days of icing and elevating my foot, taking ibuprofen, drinking lemon juice water three times a day, and adding the healing touch of rubs like Traumeel and Deep Blue, my toes’ swelling decreased a tad while the bruising deepened into a beautiful black-grape purple. I assessed they might have healed just enough to try my first ride, 29 or so miles. 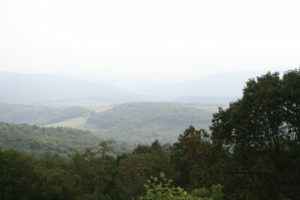 Frostburg to Rockwood sent me past scenic views not to be missed as I climbed the remaining eight miles up to the Eastern Continental Divide. Before that I’d enjoyed the vista between peaks, looking down into the valley, surrounded by dozens of bicyclists—an organized trail ride had chosen this for a rest stop. I talked with cyclists sitting on the bench I used to brace my bike, hefty with its extra traveling weight of fifty-one pounds. “Where ya headed?” a woman asked. And so the ride went, with nods and waves and smiles, and well-wishes of the trip as I encountered other cyclists. When I passed those with saddlebags hanging over their back wheels, I knew they were “through” travelers like me, riding for multiple days. In deciding I didn’t share my friends’ fitness, and chosing a shorter distance to ride, I turned this into a biking and writing vacation. In fact, I wrote the second half of this post along the trail itself, stopped next to a bridge that spanned the Casselman River. Trees screened my view, giving me only a tease of the water, but they couldn’t hide the delightfully soothing sound of it rushing through rocks. I wrote the next draft sitting outside my bed and breakfast in Confluence, enjoying the view, and sounds, of the Youghiogheny River. 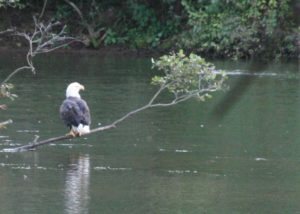 I ended this final draft when the bald eagle landed on a branch overhanging the water. Patiently, the bird waited, dove, and dragged off a catch. They envisioned camping gear, no doubt, because of my bulging front and rear bags. “I’m hanging out a few days at a bed and breakfast in Confluence, writing. The tools of the trade take up space.” I point to the laptop. We wished each other safe trails, and off they went with their petite rear bags, each half the size of mine. When I ride the trail, it’s as much about the journey as the destination. I have all day to travel twenty-nine miles, thirty miles, my short day of twelve miles. Why not stop for scenic views or to talk to other bicyclists? All you and I really need to ride the GAP, the C&O, or both, is time and a sense of adventure. If I tire, I’ll stop at the next bench, the next overlook. I’ll search for the clues that tell me about the lives so affected by this trail that loved ones have donated the bench, or that the trail groups have marked off the overlook. I’ll stop at a park sign, reading the sad history of a mining disaster. I’ll talk with the train-loving retiree who volunteers his time at the Meyersdale Train Museum, housed in the restored depot. 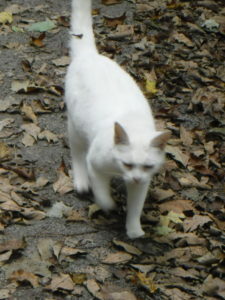 He’ll tell me of the friendly white trail cat who will trot out to greet me if he hears my bike, and I slow. Push past your comfort zones, past what you think you can do or what our societal norms say you should do when you’re a female, or you’re in your sixties, seventies, or eighties, or you have a handicap that affects your balance—trike bikes are out there. You’ll find out so much about yourself. You’ll hang on the stories your B&B mates share with you, like how Ron’s riding the GAP to celebrate turning 60, and how his buddy Mike is thrilled he could still ride, recovering as he is from a heart attack a few months back; and they’ll ask questions about your adventures. What’s a story you cherish from a time you pushed past your comfort zone? I’d love to hear it. 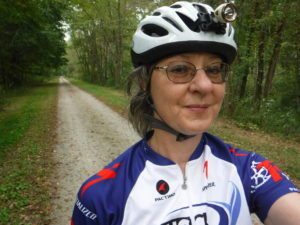 This entry was posted in Bicycling, Life Lessons, Uncategorized and tagged Bicycle touring, bicycling the C&O Trail, bicycling the GAP trail, Ride the C&O trail, Ride the GAP trail. Bookmark the permalink.